With the whole world excited about the markedly different look of sixth-gen iPhone By Apple, the speculations suggest the super beneficial four-inch screen and a small size dock connector to be featured into the upcoming handset. 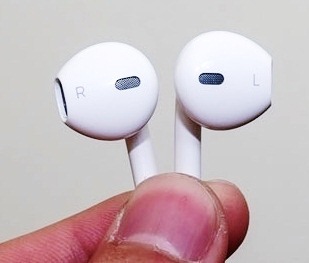 The new rumors have gone even further, indicating that the ever-awaited mysterious device will launch with a pair of redesigned earphones, as the image provided on the left demonstrates. The rumors have stemmed from a Vietnamese website, Tinhte.vn, where the hands-on video demonstrating the purported sixth-gen earphones has been posted. The video suggest that the iPhone 5 that is about to be launched comes with the completely redesigned earphones, suggested to replace the current earphones that are on the market. Manufactured by at Phax Co factory in Vietnam, the earphones have the appearance of a fully integrated, single unit, with no single part that looks like it would come apart. The video shows the comparison of the upcoming and existing earphones, identifying that the new ones are much smaller and when worn, they do not hurt the way earbuds do. In difference with the existing ones, the new earphones are clearly made in Vietnam, as the inscription on the wire says “Designed by Apple in California. Assembled in Vietnam”. With the older earbuds being mostly made in China, the video claims the iPhone 5 earphones are being assembled at a Foxconn plant in Vietnam. For those of you feeling skeptical about this Vietnamese source, please note that the same Tinhte.vn has managed to get a hold of Apple prototypes in the past. So with the September 12th event we have got no invitations to yet, the truth will be unveiled at last. By then, all we have left to do is to guesstimate, so do not hesitate to share your expectations below in the comments.